CEREC crowns from Dr. Phillip S. Tully and Dr. W. Newton Sharp in Columbus, GA repair damaged teeth in just one dental visit. Milled from a solid block of dental grade ceramic, CEREC crowns are designed, built and placed quickly and beautifully for natural-looking restorations that last for years. CEREC is an acronym for the Chairside Economical Restoration of Esthetic Ceramics or Ceramic Reconstruction. Developed by dentists in Zurich in 1980, CEREC technology produces restorations such as dental crowns and bridges that are extraordinarily life like and durable. Plus, CEREC patients receive the best in materials and diagnostics conveniently and quickly. Dr. Tully and Dr. Sharp are fully certified in the innovative CEREC process. They first perform a complete oral exam to determine if a damaged tooth can receive a CEREC crown. The Columbia University College of Dental Medicine says a dental crown completely covers tooth structure marred by decay, extensive fillings, oral injury or congenital malformation. It replicates the size, shape and color of the original tooth, creating perfect bite and protecting remaining enamel from further damage. In addition to the oral exam, Dr. Tully and Dr. Sharp use digital x-rays and an inventive combination of CT and light scanning techniques to image the tooth. With CAD-CAM software (Computer-aided Design/Computer-aided Manufacturing), they make a digital impression. This quick process eliminates gooey impressions and long wait times for lab work to be completed. They also shape the remaining tooth enamel to receive the crown. The digital impression gives the CEREC milling machine all the information needed to manufacture a beautiful all-ceramic dental crown. The manufacturing process takes 15 minutes or so, and Dr. Tully and Dr. Sharp add special shading and polishing to finish the CEREC crown. He bonds it securely in place, and amazingly, the fit and bite of a CEREC crown is perfect the very first try-on. 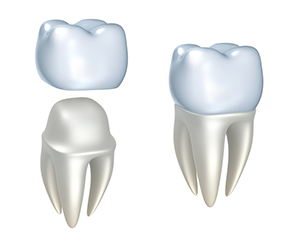 In addition, CEREC crowns cover dental implants--today's best standard for tooth replacement. CEREC technology creates partial crowns, too--beautiful inlays and onlays that replace large fillings inside and around the cusps of teeth. Bonded right to the teeth, inlays and onlays seamlessly restore teeth to full function, bite and aesthetics. today at (706) 323-6491 to schedule a consultation!